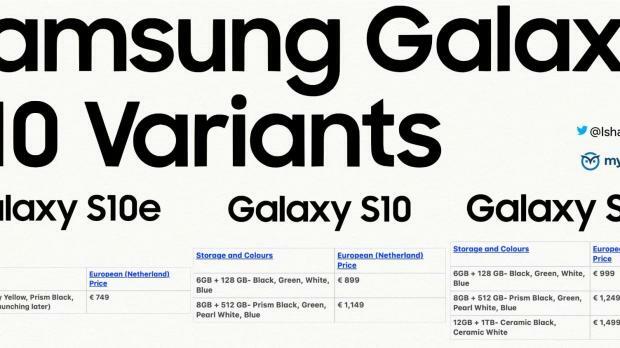 The leak indicates there will be three different versions of the Galaxy available for purchase, the cheapest of which will be called Galaxy S10e.Galaxy S10 pricesThe cheapest version will cost 749 Euros and will come with 6GB of RAM and 128GB of storage, with several colors to be offered, including Canary Yellow, Prism Black, Green, and White. A Blue version of this configuration will land at a later time. Then, it’s the Galaxy S10, which will be offered in two different configurations. The model with 6GB of RAM and 128GB of storage will cost 899 Euros and will be sold in Black, Green, White, and Blue. The upgraded configuration features 8GB of RAM and 512GB of storage and will be up for grabs for 1,149 Euros in Prism Black, Green, Pearl White, and Blue. And last but not least, it’s the Galaxy S10+ which will be offered in three versions. The cheapest Galaxy S10+ will cost 999 Euros and will feature 6GB of RAM and 128GB of storage, with four colors available, namely Black, Green, White, and Blue. The mid configuration costs 1,249 Euros and is upgraded to 8GB RAM and 512GB of storage, again with four color options – Prism Black, Green, Pearl White, and Blue. And then, there’s the top-of-the-range Galaxy S10+ available for 1,499 Euros and offered with 12GB of RAM and 1TB of storage and sold in Ceramic Blue and Ceramic White options. There are no details regarding the Galaxy S10 with 5G support, but it’s expected to hit the shelves later this year.